Product Details: Our rich and savory French Onion Mix makes an easy, savory soup and creamy, irresistable dip. You can knead it into ground meat for meatloaf, meatballs, and Salisbury steak to boost the flavor. We love it in pot roast gravy and as a marinade rub on baked pork chops. Shelf-stable; no refrigeration required; great for emergency food supplies, camping, RVing, and hiking. 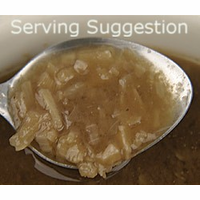 To Make French Onion Soup: Simmer 1/2 cup mix with 2 1/4 cups water for 15 - 20 minutes. To Make French Onion Dip: Stir 1/4 cup mix into 2 cups sour cream. Chill 2 hours before serving. Ingredients: onion, beef broth base (salt, autolyzed yeast, dextrose, monosodium glutamate, lactose, caramel powder, sunflower seed oil, celery, onion, garlic, cornstarch, herbs and/or spices), maltodextrin, non-GMO corn starch, natural butter flavor (non-GMO maltodextrin, sea salt, butter powder [butter (cream, salt), dry buttermilk], buttermilk, natural butter flavor, non-GMO expeller pressed canola oil, natural beta carotene coloring), non-GMO soy sauce powder (fermented soybeans, wheat, maltodextrin, salt), cane sugar, wine powder (maltodextrin, sauterne wine solids [prepared with sulfur dioxide]), roasted garlic, black pepper, ginger, natural lemon juice flavor. Contains Soy, Milk, Wheat. Packaged in a facility that also handles wheat, milk, soy, egg, sesame, peanuts, and tree nuts. Nutrition Facts: Click here for data per 1/4 cup (29 grams) NOT per serving.